On this page I've collected a bunch of the most popular types of word puzzles in one place. This should help you understand how the most widely published puzzles work, so you can decide what kind of puzzle suits you. With each puzzle, I've given you some useful background and a good example to play with - that's really the only way to learn about word puzzles after all. Find out why I reckon this program is the most powerful vocabulary builder on the market today. Learn how expert Scrabble players score 50 bonus points in virtually every game. Two time US Memory Champion reveals a technique anyone can use to recall just about anything. Learn how to make and sell your own iPhone game with no programming experience. Publish & Solve Our Own Free Word Puzzles! At first glance, an acrostic puzzle looks a lot like a crossword. There's a grid of black and white squares, for example, and a bunch of clues that have to solved in order to fill it in with letters. Don't be fooled by appearances, though. The experience of solving an acrostic is completely different to that of a crossword. As you can see in my example, the acrostic has three components. At the top is a grid of black and white squares, with rather intimidating looking indexes strewn throughout (don't worry - they're just handy labels). When the puzzle is solved, the letters in the grid will form a phrase (often a famous quote or saying). Below the grid are two columns. The right hand column consists of very crossword-esque clues, and the left hand column contains the boxes into which you enter the answers to those clues. 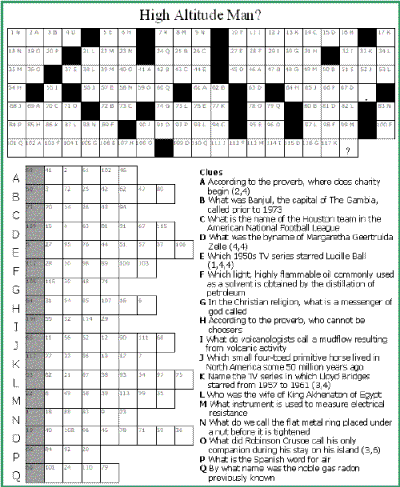 When all the answers have been completed correctly, the vertical column of shaded squares, consisting of the first letter of each answer (following a very long acrostic tradition! ), will spell out a word, name, or phrase. We'll call this the answer key. The answer key (i.e. the sequence of shaded letters) relates intimately to the phrase in the grid. If the grid phrase is a famous quote, for example, the answer key will typically spell out the name of the person behind that quote. Obviously the clues help you fill in the grid, but as you make headway into the puzzle, things can happen the other way around - certain combinations of letters in the grid (e.g. TH_) enable you to make a good guess at certain letters in the clue answers, which then helps you solve the clues. Sometimes it happens that you can work out the answer key before the puzzle is finished. That can help you fill in the grid, which in turn can help you solve your unfinished clues. No surprises here - these word puzzles have made their way into just about every major newspaper in the English-speaking world (and beyond!). So I'm not going to insult your intelligence by telling you what a crossword puzzle is. Instead, I'll just point you to Word-Buff's Crossword Puzzle Guide, where you can find out much more about them. Cryptograms are word puzzles in which your primary task is to decode a block of cipher-text. You are faced with a sequence of characters that looks like gibberish. The characters can be letters, numbers, or any other symbols you like. The idea is that each character represents a letter of the alphabet, and when all the characters are replaced with their corresponding letters, the gibberish turns into something meaningful and (hopefully!) recognizable. In this example, I've given you a toehold into the grid by telling you that the number 22 represents the letter T. The cryptograms you meet won't necessarily have hints, or themes for that matter (though the themeless cryptograms seem a bit dry and academic for me). As you work your way through the puzzle you make educated guesses at the letters being represented by certain characters by focusing on key word patterns. I'll let you have a go at the one above to get a feel for what I mean by 'key word patterns' here. At its simplest, jumble word puzzles are about anagrams. In case you've forgotten, an anagram is just a sequence of letters that you have to unscramble to form a word or phrase. But an anagram - even a really tricky one - is hardly inspiring enough to warrant a place on this prestigious word puzzles list, right? That would be like a crossword puzzle with just one clue. As with most word puzzles, a good word jumble should have several mini puzzles, tied together with a theme - preferably something curious or chuckle-worthy. And that is exactly the kind of jumble puzzle that became famous in newspapers around the world in the 1950s. On the left had side of the puzzle you can see four horizontal rows of squares. These are basic anagram puzzles. See how some of the squares have circles inscribed? These letters form the basis of a fifth anagram puzzle represented by the row of squares with circles inscribed at the very bottom of the puzzle. Now the anagram at the bottom of the word jumble - technically, the solution to the puzzle - is often a phrase, and obviously requires a clue. Where is it? To see what I mean, have a go at solving this puzzle. When you're done, you can check your answer by clicking on the image. So you can see here how a good word jumble goes well beyond simple, unconnected anagrams. A theme, usually humorous, is provided, often in the form of a cartoon or riddle, and this theme ties all the small puzzles together into a meaningful whole. The result is that small-but-satisfying 'Aha!' moment that signifies the puzzle maker has done a good job. You are presented with a list of words and a grid filled with a random-looking arrangement of letters. Your job is to find each word in the grid such that the letters in the word form a straight line-segment (horizontal, vertical, diagonal, forwards, or backwards). Here's an example of a wordsearch puzzle I created for spelling bee practice. To get you started, I've highlighted the word PRIVILEGE, so this one no longer appears in the list of unsolved words. NOTE - The example word search puzzle below is not printable. Even better! You can solve it online right here using your mouse and keyboard. It's all pretty intuitive, but if it doesn't seem to be behaving for you, just click Help. You must use a Java enabled browser to solve this puzzle. As you might gather from this example, wordsearch puzzles are particularly good for reinforcing spelling. The reason for this is that you have to scrutinize each letter and its successor in the grid, rather than just glancing at letter sequences as we do when we read. You are forced to notice explicitly that COMMITMENT has two Ms rather than one, because if you search for that word spelled with one M you simply won't find it. You'll be forced to go back to your list, re-examine the word, and consciously register the double-M. The use of themes, rather than ad hoc word lists, can also be used to improve vocabulary and general knowledge. If the theme is 'Christmas', for example, the solver may come across a new word, like YULETIDE, and remember forever after that this word is closely connected with Christmas. It's not as good as a definition, but it's certainly better than having no idea at all, right? Want to Publish Your Own Word Puzzles? I'm going to let you publish your word puzzles here for free and get tens of thousands of eyeballs on your work every month! As long as your puzzles are original, clearly explained, professional looking, and fun to solve, I'll publish them here for you. Your word puzzle will appear on a Web page exactly the way you enter it here. You can wrap a word in square brackets to make it appear bold. For example [my puzzle] would show as my puzzle on your Web page. Most word puzzles need a picture, like a grid or a cartoon, to show us what to do. Just prepare your picture on your computer and save it as a .jpg or .gif image. Click the 'Browse' button to find it on your computer, and then select it.